Pavement-Transportation Computer Assisted Structural Engineering (PCASE) develops and provides computer programs for use in the design and evaluation of transportation systems (airfields, roads, and railroads). PCASE is supported by the Tri-Services (Army, Air Force, and Navy) and is based on current Tri-Service Criteria. 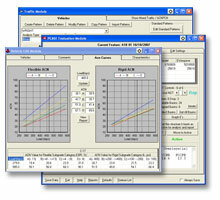 Currently available is the PCASE2.09.05 Desktop as well as other software tools. Certificate of Networthiness: Certificate of Networthiness: Current federal regulations require all major applications and general support systems to be certified as being compliant with information technology security requirements so that information resources and data are protected adequately. For more information concerning the PCASE Certificate of Networthiness (CON) or the US Marine Corps Authorization to Operate (ATO), please contact George Van Steenburg at George.W.VanSteenburg@usace.army.mil or Air Force CON contact Harold Muniz at harold.muniz_ruiz.4@us.af.mil.